After more than a year's absence, Menasha Ridge Press and the Appalachian Trail Conservancy announce the third edition of Leonard's award-winning Wildflowers of the Appalachian Trail. In an 8" X 8" format and featuring the same stunning full-page color photographs by Joe Cook and Monica Sheppard, the new edition contains additional wildflowers. Leonard’s detailed descriptions include bloom seasons, leaves and stem descriptions, and geographic ranges of growth, along with the fascinating role the wildflowers have played throughout history and their value in folklore as well as in modern medicine. Citations to more than sixty additional species with respect to their distinguishing features are included. Uniquely, the book notes specific sites along the trail where flower species may be seen. The book’s first edition received the National Outdoor Book and Foreword Magazine’s Book of the Year awards and a Virginia Literary Award nomination. Leonard M. Adkins, profiled by Backpacker magazine, and referred to as “The Habitual Hiker,” has hiked more than 20,000 miles exploring the backcountry areas of the U.S., Canada, Europe, and the Caribbean. Almost every hiking season finds him on some new and exciting adventure. He has hiked the full length of the Appalachian Trail five times (click the Hiking GA to ME button above to read reports from the fifth journey), traversed the Continental Divide from Canada to Mexico, followed the Pacific Northwest Trail through Montana, Idaho, and Washington, and walked Canada’s Great Divide Trail. Other long-distance journeys include Vermont’s Long Trail, West Virginia’s Allegheny Trail, and the Ozark Highlands Trail in Arkansas. His adventures in Europe include a trek of the Pyrenees High Route from the Atlantic to the Mediterranean along the border of France and Spain and an exploration of Iceland’s interior. The off-season is spent writing books and articles. Leonard’s words and photographs have appeared in Islands, Caribbean Travel and Life, Blue Ridge Outdoors, Backpacker, Colorado Daily, Mid-Atlantic Country, Charleston Gazette, and other newspapers, magazines, and websites. He is currently The Good Walk columnist for Blue Ridge Country magazine. Leonard is the author of 20 books on the outdoors, nature, and travel, and his Wildflowers of the Appalachian Trail (photographers Joe and Monica Cook) received the National Outdoor Book Award, ForeWord Magazine’s Book of the Year Award, and a Virginia Literary Award nomination. The Appalachian Trail: A Visitor’s Companion was honored by the Society of American Travel Writers Foundation with a Lowell Thomas Travel Journalism Award. Leonard is not just a writer; he takes an active part in all of the books he produces. He walked all of the trails he writes about in his hiking guides with a surveyor’s measuring wheel to insure accurate mileage and descriptions. For his travel books Maryland: An Explorer’s Guide, West Virginia: An Explorer's Guide, and Adventure Guide to Virginia, he visited all of the places he describes: bed & breakfasts, restaurants, historic sites, museums, golf courses, bookstores, antique shops, amusement parks, beaches, hiking, biking, canoeing, kayaking, rafting, and more. Jobs as an Assistant Director for George Mason University’s Outdoor Education Center and interpreter for the Virginia State Parks system helped increase his knowledge of the outdoors. He has been a ridgerunner and an Appalachian Trail Natural Heritage Monitor-aiding the AT Conservancy and National Park Service in overseeing the welfare of rare and endangered plants-served on the Roanoke Appalachian Trail Club's Board of Directors, maintained a section of the Appalachian Trail, and was an editor for the Appalachian Long Distance Hikers Association's newsletter and is currently a field editor for the Thru-Hiker's Companion. Recently, the Habitual Hiker has been sharing his love of the outdoors by presenting multimedia programs (please click Presentations above) to an array of audiences. Judging by comments from university students, civic organizations, scout troops, outdoor outfitting customers, naturalists, poets, and armchair travelers, Leonard’s programs have entertained, delighted, and informed. Be it tropical islands, snowcapped peaks, emerald forests, or stark desert tracts, the presentations speak to the inner soul of each of us, reminding us of the peace, contentment, and joy only to be found in the freedom of traveling the natural world on foot. "Thank you so much for your presentation; it was well received." Along with his thru-hiking wife, Laurie “The Umbrella Lady,” Leonard currently lives in Virginia. Leonard has recently received several honors. 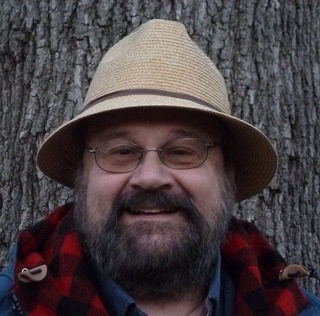 His book, “Wildflowers of the Blue Ridge and Great Smoky Mountains,” was nominated for the Virginia Literary Award, and he has been accepted into the Society of American Travel Writers. In December, Leonard received the West Virginia Division of Tourism's Stars of the Industry Award for his article "New River Gorge Trails" in Blue Ridge Country Magazine, and in October he received the Award of Merit from the International Regional Magazine Association for his work on the column. In June, the series of articles he wrote and photographs he took during his hike of the Appalachian Trail (hit the GA-ME button above to read them) received a number of awards from the Society of American Travel Writers (www.satw.org) Atlantic/Caribbbean Chapter's Writing and Photography Contest. In August, Leonard and the series of articles received a Lifestyle Columnist award from the West Virginia Press Association. This site and all articles, content, and photographs are copyrighted material. Copyright 2019 by Leonard M. Adkins, www.habitualhiker.com. No content from this website may be reproduced in any form in any media without the express written permission of the author.